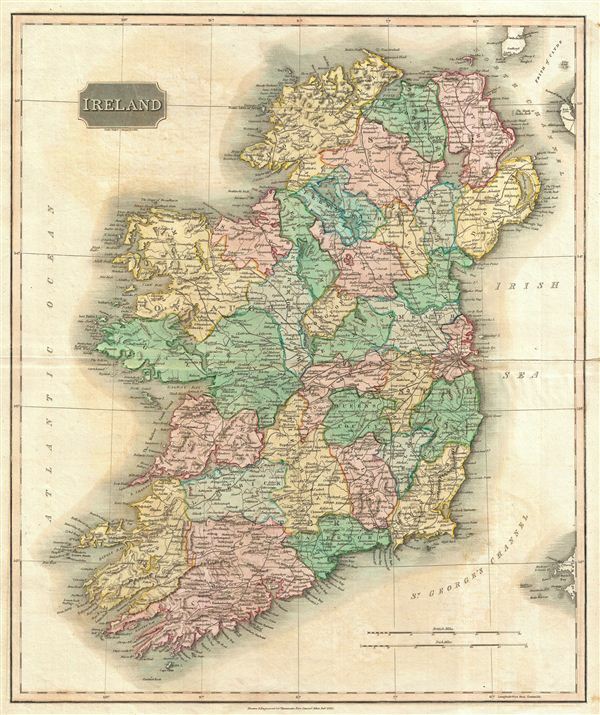 This is an exceptionally fine example of John Thomson's 1814 map of Ireland. Thomson uses color coding to break down the island into its many counties. The whole is beautifully engraved in the minimalist English style pioneered in the early part of the 19th century. Relief is shown by hachure with towns, roadways, cities, and major topographical features identified. This map is a steel plate engraving by Samuel John Neele and was prepared by John Thomson for inclusion in the 1817 edition of Thomson's New General Atlas. Very good condition. Original centerfold exhibits some minor verso repair and reinforcement on the right side. Some offsetting. Original plate mark visible. Blank on verso.